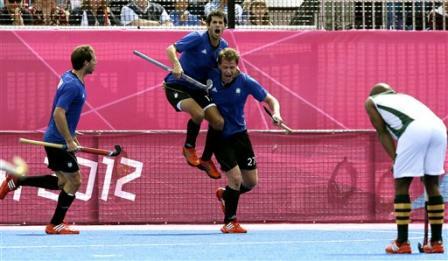 ← London 2012, Men’s Competition: A Look Back. The Top of the D has already given the end of tournament report for the top six ranked men’s teams at London 2012, here. Now it is the turn of those ranked 7-12. Star men: Shafqat Rasool was a pleasure to watch at times during the tournament. His virtuoso display against South Africa in one of the games of the tournament was a joy to behold. The South African defence simply could not deal with his skill and pace as he scored one goal and had a hand in others during a 5-4 victory. When he was on song, Pakistan looked like a real threat going forwards. Mostly happy. An improvement on their world ranking of one place was a good result for a squad that came into the tournament in disarray, plagued by infighting and selection issues. Pakistan are no longer the world force they once were, instead scrapping in the second tier of the world game. Finishing above Korea and New Zealand, both ranked higher then them going into the tournament, should give them cause to be happy. They have some very talented attacking players, who have time on their side. They will, however need to sort out their off field problems if they are to kick on. Top Goal scorer: Nam Hyun-Woo (4.). Star men: Captain Seungil Lee was his usual solid self at the back for the Koreans, and even popped up in a forward position to get his name on the score sheet against India. Nam Hyun-Woo was a constant threat from penalty corners, finishing as his side’s top goal scorer, repeating the feat he achieved in the qualifying tournament. For a side that struggled to create chances, his input was vital. On the whole, I think Korea will be slightly disappointed. To finish two places below your world ranking is hardly ideal, but it is the manner in which they did so which will grate. Having got off to a great start with a 2-0 win over New Zealand in their opening match, they were made to pay as the tournament wore on for their shyness in front of goal. For the most part, Korea were competitive in their games, but lacked that cutting edge to turn games in their favour. Star men: Simon Child and Nick Wilson were at times very impressive up front. Their pace and skill on the ball causing havoc for opposing defences. Plus, Child scored one of the hardest hit reverse stick shots I have ever seen, against Germany, which is always worth a mention! Richard Petherick at the back was a hugely imposing presence and also offered a goal threat from penalty corners. He looks the part and commands things for the Blacksticks. Disappointed. Having been one of the form sides going into the tournament, winning the Sultan Azlan Shah Cup and collecting some notable scalps in the warm up games, it never quite clicked for the Blacksticks. They got off to the worst possible start, losing their first game to a workmanlike Korean side, and seemed to struggle to find their best form thereafter. The final pool game against Germany was a neat summary of the Kiwis’ tournament: 4-2 up at half time after some sublime attacking hockey, then 5-2 up a minute after the break, before some slapstick defending and loss of concentration saw them have to settle for a 5-5 draw. Star men: Goalkeeper Juan Manuel Vivaldi did his reputation no harm with a series of fine saves, notably in the 2-2 draw with Australia. His team spent large amounts of time under pressure, and the efforts of their No1 helped them out no end. Matias Vila, the eldest of the three brothers was a good link between midfield and attack throughout the tournament. Hard to say but probably about what they would have expected. Argentina showed flashes of what they are capable of as they came from two goals down to draw 2-2 with Australia, and then they ran riot against South Africa scoring six times. However, too often, they were found wanting at crucial times. Their ill discipline was costly too, which is inexcusable at this level. Star men: Rassie Pieterse was superb in most of the games his side played. Despite the unflattering goals against column in the table the 28-year-old goalkeeper performed miracles at times to keep some of the scores respectable. From an outfield perspective, I was very impressed with Lloyd Norris-Jones. The former Canterbury player looked dangerous cutting in from wide areas and worked the channels tirelessly. He was at the heart of a lot of their best attacking work. As with the Koreans and Argentina, the most disappointing aspect of the tournament for South Africa was the amount of times they were competitive in games, only to throw them away with lapses in concentration at crucial times. Their performance against Great Britain was superb for the most part, especially after the shellacking they had received from Australia in their opening game. They were disciplined and well organised and even got their noses in front, only to throw the three points away, having to settle for one instead. 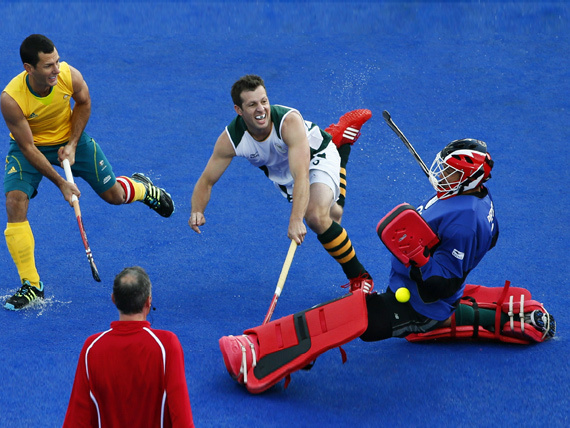 It is perhaps symptomatic of the level of international hockey the squad plays all year round: Against their usual opposition, they will get away with mistakes, because their rivals are not sufficiently equipped to punish them. At the Olympics, such leniency is in short supply. This definitely showed on the biggest stage of all. Sardar Singh continues to be the player who catches the eye the most in the Indian line up. The 26-year-old midfield player tried manfully to spur his team on from midfield, but ultimately he was ploughing a lone furrow. Very disappointed. India did not win a game. They may have long since put their expectations of medals on hold, but would never have expected to wind up winless and dead last. Ultimately, they were not good enough. In a sport where the gap is getting smaller between the big teams and the so-called minnows, India were simply swept aside by teams they may have previously expected to beat. It is easy to get carried away when your team finishes last at a major tournament, but the post-mortem for this one will be long and painful. Don’t forget you can still access the full range of The Top of the D’s match reports by clicking on the London 2012 options in the menu at the top of the page. Next week, TTOTD will review the Women’s tournament.